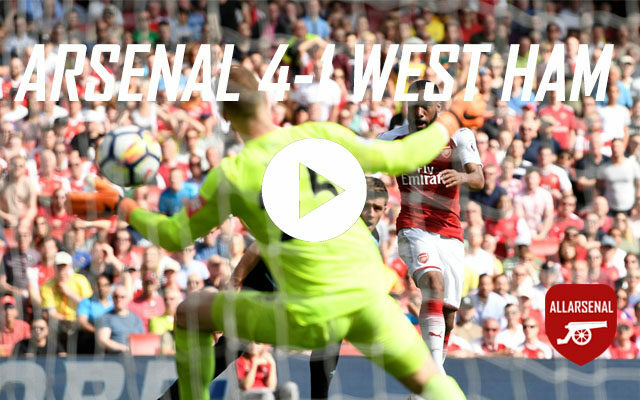 Arsenal survived a late scare before securing a 4-1 victory over West Ham at the Emirates. It was always going to be tough for Arsenal’s players to put the events of the last 48 hours behind them and put in a performance here. Whether it was down to Arsene Wenger’s decision or not, the Gunners did not start this match well. The first-half drifted by without much action but Arsenal took the lead through the lethal Nacho Monreal just after the break. Marko Arnautovic levelled things up for the visitors before Arsenal put this game to bed in the final twenty minutes. Aaron Ramsey’s intended cross somehow made it 2-1 before Alexandre Lacazette popped up with a late brace to make things comfortable for the Gunners. Here are all the goals and best bits (will open in a new Streamable tab).